Outline by Harlan Ellison Adapted by Len Wein Artwork Garcia-Lopez There has long been speculation of just how Harvey Dent and villain alter ego Two Face would play in the 60s Bat series. After all it is a more lighthearted affair. Even the Joker here is more mischievous than murderous (I actually prefer this as I think it keeps Joker mystique in tact) . Well we need ask no longer. Harlan Ellison wrote an outline for the 66 episode that would introduce Dent. It was rejected most say in favour of the one and done villain false face. (Upon reading the script i’m not sure that a certainty but it makes sense.) Firstly I would advise buying this story in the volume 4 Batman 66 volume. Unless you’ve any desire to keep the stand alone story as a collector this volume will give you a load of other 66 stories as pretty much a bonus . So the story itself. It works. Two face is obsessed with the number 2 as you would expect for a 60s Villain. To the point where if the coin lands correctly he will repay his victims plus interest! I thought that was quite a clever take. The Freezer origin is glossed over in the Bat Cave but it’s all here at least in dialog. A bit like Bruce’s origin was 2 lines of dialog in Episode 1 of the series. The darker parts of the Batman are there they just aren’t emphasised as much as the fun and the flat out crazy. The fun and crazy are just as much Batman as the dark Gothic horror.. But in 2 face’s appearance there is some of that (and a scene with a candle that would have scared some kids in 66) . Part way through the episode the caped crusaders go to Two Faces hideout (regular stuff here). The Comic adaptation uses 2 faces own island hideout. Something that would have been very big budget and i’m not sure the series would have gone there. The notes on the script gave 2 options of hide out the other was an abandoned movie studio much like the one the Riddler would use in the silent movies episode. This made me wonder if the episode should have been in season 1 even though the pacing seemed more like a season 3 episode of the series. 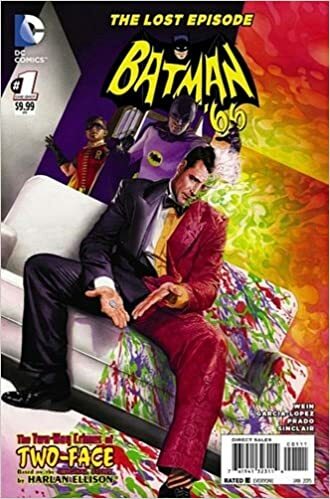 Perhaps it would have taken one of those Riddler 2 parters (he did return more than any other villain in season 1) Retro Modern Score 4/5 A great look at what might have been and if you loved the TV series and wondered about Dent it’s worth a look… Or maybe wait for the Movie. Until Next Time Have a Great Dayyyyyyyy!!!!!!! !